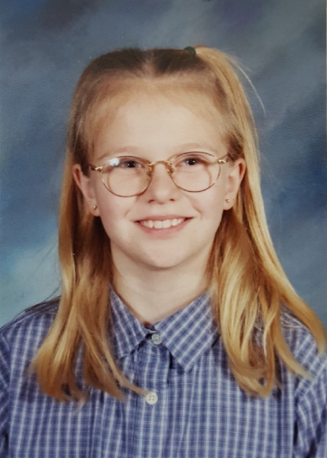 I have worn glasses since I was four years old. I vividly remember waiting in the drive-thru line at Jack in the Box with my grandma when I saw what I thought was a scuba diver climbing a tree trunk. After taking a little while to decipher what I was talking about, my grandma realized that I was looking at a transformer on a telephone pole only about 20 feet from our car. Shortly thereafter I received my first pair of 90’s style, round, coke-bottle glasses. When I was in high school I finally convinced my parents to let me try contacts. I struggled just like everyone else at first. Putting them in was a nightmare and remembering to take them out at night was a miracle. By the time I was in college I had tried everything my optometrist offered – gas permeable lenses, soft contacts, and “piggy-back” lenses. No matter how we tweaked the prescription, I still couldn’t see as well as I could with my glasses. My eyes were tired after a long day studying, the glare from headlights at night was terrible, and my eyes constantly felt dry. I saw people around me getting LASIK and finally asked my optometrist, a LASIK consultant, if I was a good candidate. He tried to break it to me softly, but the answer was no. A couple years later I found myself in the same predicament, I was in my early twenties going through the same trial-and-error phase of new contacts with a new optometrist. Finally, after multiple visits, I asked him the same question – could I have LASIK? Yet again the answer was No. This time it was described to me in more detail. I was told I couldn’t have LASIK because I was far-sighted. He said LASIK was only for people who needed tissue removed, and I needed tissue added. Plus, I have a relatively high amount of astigmatism and that would only complicate things. At this point, more than one highly-rated doctor had told me no, and of course I believed them. I went on with life and dealt with the same issues I had dealt with as a teenager and college student. Nothing about contacts got easier, except for putting them in. I continued to prefer my vision when I was wearing glasses, but I hated how they magnified my eyes and caught all the raindrops on a drizzly day, not to mention I missed wearing sunglasses! Today I am working as a Research Coordinator at Parkhurst NuVision. I have loved research for as long as I can remember and when the opportunity opened to join this fantastic team, I couldn’t say no! Out of the blue on a Friday afternoon I showed Dr. Parkhurst my diagnostic scans and asked him the same question I had asked my optometrists years before. The worst he could say was no, and it wasn’t as if I hadn’t heard that before. I was shocked when he said “Yes, you can have LASIK.” He asked why I thought I couldn’t and I told him the same story I’ve written here. He told me everything I was told didn’t apply to today’s Modern LASIK. Technology has improved and patients who were previously not a candidate may now be a good fit for LASIK. I was grinning ear-to-ear all weekend. expectations were set too high. I knew without a doubt I was in the best hands, but my nerves were still getting the best of me. My incredible coworkers brought me the “happy pill” and my nerves slipped away. During the first part of the procedure the LASIK flap is created. Dr. Parkhurst applied plenty of numbing drops, told me where to look and walked me through what I would be seeing as the process continued. Before I knew it, the flaps were created and we were moving on to the next step. Dr. Parkhurst took his time to mark my eyes before starting the laser correction since I had such a high astigmatism. The second half of the procedure involves the laser which reshapes the cornea to correct your vision. I stared at a light like Dr. Parkhurst told me to and within a couple minutes, he told me we were done. I sat up and was blown away. At first my vision was a little cloudy and exactly like looking through a shower curtain, which is to be expected. Within minutes I could see details on the wall and on my friends’ faces in the waiting area. I told myself I wouldn’t cry, but I couldn’t help it. I hugged Dr. Parkhurst as tears welled up in my eyes and I knew at that moment I had made one of the best decisions I have ever made. Later that day I was seeing better than 20/20, when earlier that morning I was 20/250! It has been 1 month today since I had LASIK and I only wish I had done it sooner! The best part of it all has been how hassle-free my vision is. I can read shampoo bottles in the shower! I don’t have to take my contacts out and put my glasses on to drive home. I don’t have to remember to take out contacts before bed. 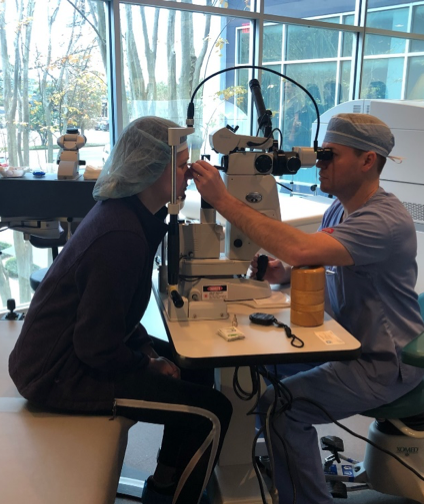 My vision, and my life in general, is forever improved thanks to Dr. Parkhurst and the amazing team I work with here at Parkhurst NuVision.